A computer case is the most visible portion of your build - so choose a design you love. There are many options to go with when it comes to a PC case - from popular pre-configured atx desktop cases designed for most standard builds to those you can custom mod into a gaming PC case. Desktop cases at their core function house & protect the internal components of a build. Because they last for a long while and act as a shield for your components from the outside, choosing a good case is important and will let you carry it over to future builds & upgrades over the years. Depending on your budget though, this isn't a terrible item to go cheap on because as far as the day-to-day functionality of your system the case doesn't contribute as much as other components do. From elaborate paint jobs to side-windows that let you peer into your setup - cases can be an expression of your style though. Choose the right size case for the components you will be installing into it - ATX cases can house larger builds and support both ATX and mATX motherboards. Micro ATX cases only support mATX boards and tend to be smaller than ATX. ITX cases support ITX boards only. 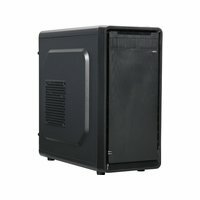 What should I look for when buying a computer case? Is this computer case large enough to fit my video card? Is this PC case wide enough to fit my CPU cooler? How many fans, and what size, can be installed in my computer case? How many hard drives bays are enough in a computer case? Will I be able to upagrade this PC case later? These questions will help to find a lot of the answers you'll be looking for. Video cards can get long, so be sure that you can fit the card that you really want, because otherwise you'll have to change either your card or your case. Computer parts aren't the kind of hardware that you can hammer in to make fit; they either fit, or they don't. For cooling, many systems can get by with a front intake and rear exhaust. However, gaming systems and 3D renderers will need a case that breathes easily and has plenty of circulation using 4 or more fans. Otherwise your case interior will heat up and could fry your components. And don't forget that you'll need enough width for your CPU heatsink. Most cases cases, especially ATX cases, have plenty of room for hard drives, but how compatible are they with solid state drives? If you plan on installing the latest in data storage technology, make sure your case is compatible, or you'll likely need to purchase a mounting adapter. And last, but not least, will you be able to install more hardware later? One of the great features of building you own system is the ability to more easily customize and mod your system. This could be hard to do if you don't have enough room, though. Get a case with some breathing room you can install that new sound card, fan controller, or other component later on. What are the basic case sizes out there? 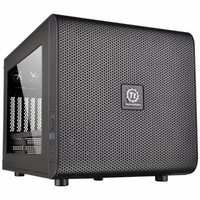 The most popular case form factors for PC builders are ATX, Micro ATX, and Mini ITX. We are proud to feature brands such as Antec, BitFenix, NZXT, Fractal Design, and many more in our selection of personal computer cases. What features should I look for in a computer case? Basic features in computer cases to look for are motherboard form factor compatibility, number of hard drive bays, internal space for a video card, as well as room for your cooling systems, whether they are case fans, or CPU liquid cooling. More minimal features that are of interest are the front I/O (USB 2.0 or USB 3.0, 3.5mm Audio, eSATA, etc. ), and hard drive installation features such as front 3.5 inch drive bays, and toolless internal drive bays. 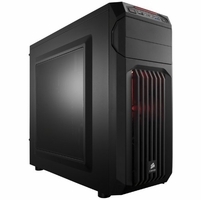 What is the right computer case for me? The kind of system you want to build is a strong determing factor in the type of case you should buy. For a gaming PC, you'll likely want a larger case with plenty of room for at least one video card and a hefty cooling system, so a mid-tower ATX Case is good starting point, the step-up from which would be a full tower ATX computer case, which some could also support E-ATX and larger motherboard sizes. 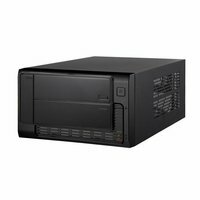 For a standard SOHO (Small Office/Home Office) computer, you could go with a mid-tower, or even a MicroATX or Mini-ITX system, depending on the kind of hardware you want to install. HTPCs (Home Theater PCs) are often used as a entertainment or media hub, so you'll likely want to use a Mini-ITX case to create a discrete system that will look good in your living room. You can also save quite a bit of money if you go with refurbished or used computer towers so if that fits all your needs, that is a good way to proceed. 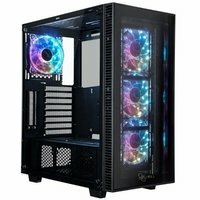 How to shop for a computer case? The style of PC case you choose can speak a lot about the kind of system you want to build - when you build your own PC, it's totally up to you how it looks. 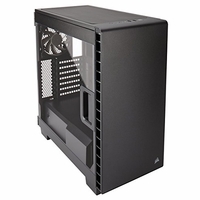 Make sure you get the kind of case that fits your motherboard size - a MicroATX motherboard will fit in ATX cases or MicroATX case, while an ATX motherboard will only fit in an ATX case. 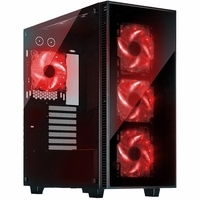 Many gaming PC cases include spots for cooling fans, and feature decorative side panel windows and bright LEDs that showcase your computer's high end components. If you want a computer case with as much glow as possible, aftermarket are available. Unless your planning on something crazy, like installing a computer into a fish tank, you're going to need a PC case. Also called a chassis, your PC case is the metal housing which stores and protects all the geeky gizmos that make up your computer. Whether you're building a new machine or your rig's just ready for a new outfit, here are a few things you want to think about while choosing the best case for your computer. "And now, your highness, we will discuss the location of your hidden rebel [PC Case] . . ."
A lot of the decisions you make when putting together a new computer depend on its location and purpose; the case is no exception. Cases come in lots of shapes and sizes, from massive full-tower chassis, as big as a mini-fridge, to tiny home-theater cases about the size of a bag of chips. Folks who buy the big, "full-tower" cases are generally more concerned about the chassis' interior space, which allows the best upgrade and component choices of all the cases, than they are about how much space their PC will occupy in the desk area. High-end workstations and gaming rigs will need a case like this, since they offer enough space for massive graphics cards, large, after-market cooling fans, and often come with rubber grommeted holes for liquid cooling systems. A full-tower isn't for everyone though, they average about 20-22 inches in height and depth and often weigh upwards of thirty pounds. The average user will want to choose a "mid-tower" case. These cases posses most of the benefits of full cases but are a little more space conscience, averaging 16-18 inches in height and 18-20 inches in depth. They're often preferable to full-tower models since they're a tad less imposing than their big brothers and don't command quite so much attention. Most mid-tower cases will fit full-sized video cards and cooling fans, but expect space to be limited if you plan on getting too fancy. These are the smallest of all PC cases and are typically meant for very specialized rigs like a Home-Theater PCs or Home Servers. They're usually only 2-4 inches tall or thick (some ITX cases are horizontal like a VCR or DVD player while some are vertical like a book on a bookshelf) and about a foot in depth. Their small size allows them to fit easily into a home-theater system or to be placed on a shelf or in a cupboard. You'll have to be very conscience of space, however; the case interior will be very cramped, so you'll have to be very choosy in buying your parts. "Low-profile" or "slim" hard drives and expansion cards are a must here. "[The PC Case] and I were about as compatible as a rat and a boa constrictor"
-HTPC / ITX cases hold mATX and ITX motherboards. Aside from motherboards, you'll want to consider any expansion cards you'll be getting. Some cases require low-profile adapter cards, and some will be too short to handle the super-sized graphics cards used in tricked-out gaming systems. "The need of [PC Case] expansion is as genuine as instinct in man as the need in a plant for the light"
5.25" - These are the external drive slots you use for CD, DVD, and Blu-Ray drives; most cases have two, though some have as many as five. There are other types of devices which can be installed in these ports, but that would be the point of a whole other article (which I'll link here once I've written it). 3.5" (External) - These bays are most commonly used for card-readers and the antiquated floppy-drive. Few cases sport more than one of these ports, and many forgo them altogether, so if you're set on having one you may have to make a little extra effort. 3.5" (Internal) - This is, without a doubt, the most abundant drive-bay resource on the planet! These internal ports are where hard drives are installed, and most cases have at least four of them, though larger ones may have as many as eight. 2.5" (Internal) - This super-small drive-bay is actually meant for laptop computers and isn't typically found in a desktop. I mention them, however, because many of the ever-more popular solid-state data drives are actually sized for a 2.5" bay. Should you wish to install one of these in your desktop, you'll need a 2.5" to 3.5" drive-bay adapter. "You've got the stuff . . . You've got the POWAHHH [Supply]!!!! Some PC cases come with a built-in power supply. 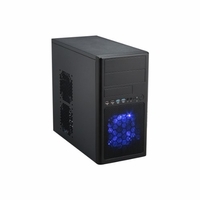 These cases are usually mid-to-low-end and are geared towards those looking for a quick and easy build. However the PSUs built into these cases are (almost) all bottom-of-the-line units which are inefficient and not at all geared for performance PCs. If your intended build is fairly basic, you'll probably be happy with your built-in power supply. Those building high-powered or highly-efficient computers, however, will be better served by the purchase of a power-supply-less case and by choosing a more potent, separate PSU to fit their needs. "I can take it . . . The tougher it gets, the cooler [my case] gets . . ."
In the world of computing, cool is equal to quiet. All of the noise you hear from your computer comes from the fans which work tirelessly to extract all the heat pumped out from your CPU, hard drives, RAM, video cards, motherboards, and other components. While the most direct heat removal duties fall to CPU fans and heat sinks, the more general cooling duty of keeping down ambient temperature falls to the PC Chassis. So, unless you want your computer to sound like a sick Dirt Devil, you'll want to pick a case with a decent cooling system. Though some cases are equipped with liquid cooling systems, the general cooling duties fall to case fans. The basic thermal dynamics of a case interior are pretty simple: heat is generated from a processor or other component, captured by a heatsink, disbursed into the air inside the case by fans or heat-fins, and then pushed outside the case by the case fans. Look for a case that has several large fans and you'll have a much cooler and thus quieter computer. "When I'm good I'm very good, but when I'm bad I'm [a cool-looking computer chassis]"
Of course, one last consideration is the way your case looks-some cases look really, really cool! LED lighting, most commonly found in red, blue, and green, is pretty easy to come by, you can even pick up extra case fans with matching lighting to improve the effect. Some cases also have a clear side panel so you can show off the case interior if that's your thing.